While I’m a sucker myself for some of the quest-type Wii games (Super Mario Brothers, Anything Lego), I do sometimes like to have a short family game play with something like New Carnival Games for the Wii. The latest release from 2KPlay, this game is an updated version to the popular Carnival games. There are over 30 new carnival-related games that you can play up to four players like Haunted House, Bumper Cars and Ring Toss. It’s cute, it’s quick and it’s good for lots of laughs with family members of all ages. 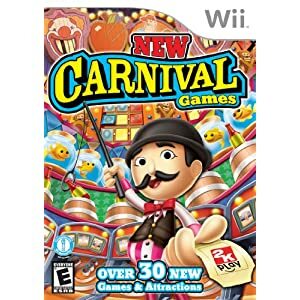 Get the new Carnival Games for the Wii on Amazon for $37.99 with free shipping.